Posted September 26, 2018 by lauterbachadmin | cs5711, Uncategorized. Two of the inevitable problems in vineyards are Rodents and Birds. Rodents burrow in the ground and eat the roots of the vines. Every year we lose vines to the moles and voles. Barn Owls usually consume about 6 voles or vole-sized rodents per night, about 1/3 of their total body weight in food consumption. That’s some 4,000 rodents a year, what a yummy diet. We also move a perch to areas of high rodent population, “hey owls, dinner is over here”. Old techniques includes setting traps in the burrows, a time consuming and not very effective process . There are devices that inject propane and oxygen into the gopher tracks that explode killing the gophers with concussive forces. Poison baits have been used but if predators eat the poisoned rodents the poison moves up the food chain, not a good plan. Birds eat grapes. A flock of birds can damage a vineyard in a day costing tens of thousands of dollars. We now use a recording of starlings in distress, alternating with preditory raptors to scare the birds away. We use kites of paragon falcons mounted on long poles that fly over the vineyard to scare off the birds. This has proven quite successful for us. Alternative methods include netting the vines, a labor intensive and costly technique. Propane cannons set to explode on a schedule during the day are effective, but the noise is a nuisance. Some vintners hang reflective tape for the vines that flitters in the wind and scares the birds. There has been a concerted effort in the vineyard industry to move away chemicals and poisons. The industry encourages the use of environmentally friendly techniques. 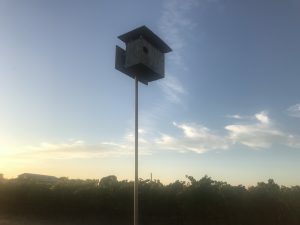 Natural pest control through the use of Owls and Raptors are just a couple of examples of the vineyard industry’s attempt to become one of the most green farming businesses. Copyright © 2019 Lauterbach Cellars. All Rights Reserved.